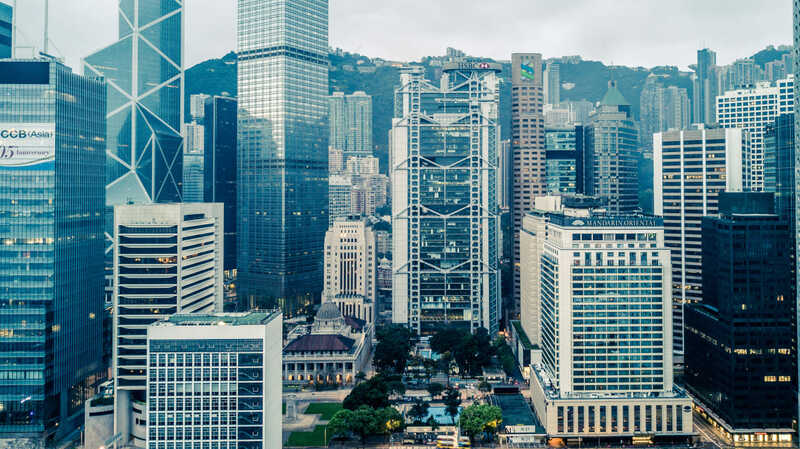 This is by far my favorite building in Hong Kong. Foster’s HSBC Building is a classic built over 30 years ago and unique until today. This is by far my favorite building in Hong Kong. Foster's HSBC Building is a classic built over 30 years ago and unique until today. From afar, it is a strange building. Unlike its neighbors, its structure is in full display, tall steel masts along the facade supporting large triangular trusses. The trusses also correspond to the building's unique circulation system, in which double height floors function as sky-lobbies from which the internal flow continues on escalators. Getting closer, its uniqueness becomes more evident. It is a wide and deep building, but its interior space is free of columns or elevator cores. The building's structural systems allow for all circulation to be place at both east and west ends, leaving the whole middle of the building completely unobstructed by structure. The design goes further and makes use of this feature for both the city and building itself. First it elevates the whole building from the ground, creating a public, covered plaza open on both north and south ends. It is a building that does not occupy public space, but creates it. On Sundays, the plaza becomes a meeting point Hong Kong's Filipino maids population as a beautiful example of a public space being adopted by the population. 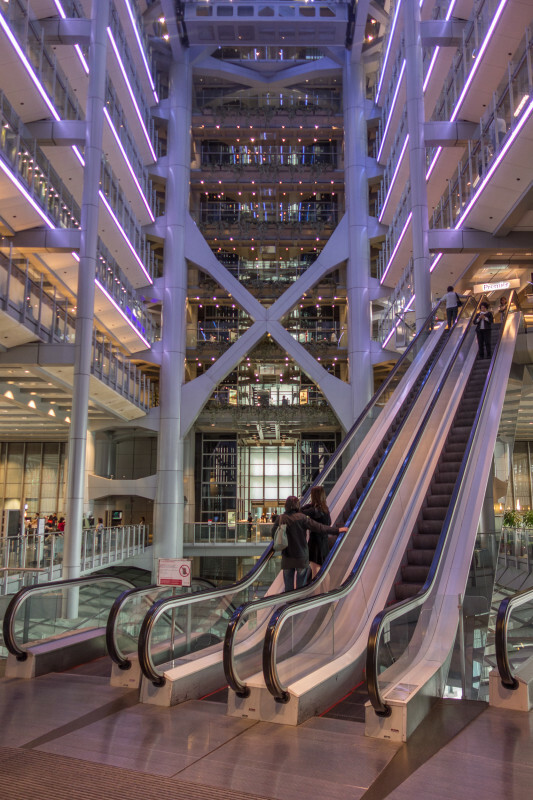 Secondly, its deep floor plans are cut through by a enormous 50m-high atrium, on top of which a series of large mirrors bring light all the way down to the plaza through its transparent underbelly. You can peek into the building not through the facades, but by going under it. It is fantastic! From the plaza, two large escalators take you right into the atrium, where a public branch of the bank is open to the public, while two large bronze lions stand guard, one of them even carrying scars of the Japanese war as bullet marks on its flank. 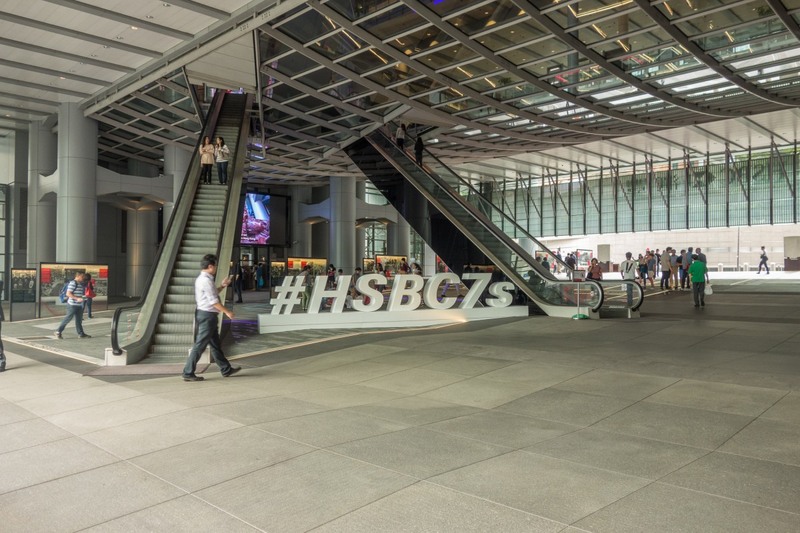 The HSBC Building is full of symbolism, from the guarding lions, which should bring luck and prosperity to the bank, to the strong application of Feng Shui principles in the design and construction. It also symbolizes a type of building that break rules and set new standards and parameters. Much like Paris's Pompidou or London's Lloyd Bank, the HSBC Building is a display of structural and technical honesty.